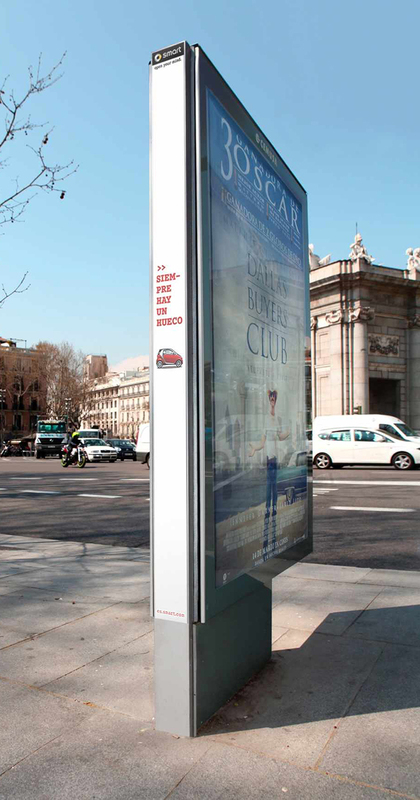 In a world of crowded ad spaces and precious few parking spaces, Mercedes and Madrid agency Contrapunto BBDO are hoping to make the most of both shortcomings with these cleverly placed Smart car ads. Printed on the narrow side of an outdoor ad display, the small image of a Smart is joined by the phrase "Siempre hay un hueco," Spanish for "There's always a space." As commenters on Ads of the World were quick to point out, this idea isn't exactly a first of its kind. The line and basic premise were even used in a student project in Argentina last year. Duplication aside, there's also a more pertinent issue: I doubt I would have even noticed it if someone else hadn't pointed it out as an ad.